Quick overview From the author of the acclaimed The Time In Between - what mental illness is really like for young women, and how we can all better understand it. Conversations about mental health are increasing, but we still seldom hear what it's really like to suffer from mental illness. Enter Nancy Tucker, author of the acclaimed eating disorder memoir, The Time In Between. 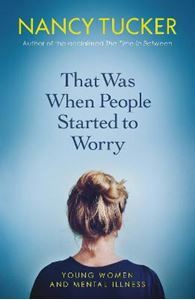 Based on her interviews with young women aged 16-25, That Was When People Started to Worry weaves together experiences of mental illness into moving narratives, humorous anecdotes, and guidance as to how we can all be more empathetic towards those who suffer. Tucker offers an authentic impression of seven common mental illnesses: depression, anxiety, bipolar disorder, self-harm, disordered eating, PTSD and borderline personality disorder.